BOULDER, Colo. — Bryce Alford poured in a career-high 37 points to lead No. 4 UCLA to a 104-89 win over Colorado in a college basketball AP Top 25 score on Thursday night. Alford shot 11-of-18 from the floor and made 9 of 12 from long-range on the night to set a school record for 3-pointers. Isaac Hamilton added 20 points with four rebounds, Aaron Holiday scored 14 points, TJ Leaf ended with 12 points and five rebounds and Lonzo Ball ended with 11 points, eight assists and three steals for the Bruins (17-1, 4-1 Pac-12), who won four straight. Xavier Johnson led Colorado with 21 points and six rebounds, Derrick White added 20 points and George King finished with 13 points and five boards for the Buffaloes (10-7, 0-4), who remained winless in conference play this season. “This is the best offensive team in the country,” Colorado coach Tad Boyle said. He added after his team’s fourth straight defeat: “We definitely lost some swagger. It’s hard to have swagger when you’re 0-4. “But you can’t lose your heart and you can’t lose your determination and you can’t lose your fight. We haven’t lost that. I promise you. Wesley Gordon had 12 points and six rebounds and Bryce Peters scored 11 points for Colorado, which shot 47 percent from the field and 42 percent from 3-point range. UCLA opened the contest by scoring the first five points before Colorado used a 12-4 run to take a 12-9 lead early in the half. However, the Bruins came back to lead 34-26 with 6:18 left in the first half before taking a 51-45 advantage at halftime. The lead increased to double-figures early in the second half and kept building as Leaf took over to score 25 points after the interval, while making seven 3-pointers during that period. In another AP Top 25 basketball score on Thursday night, No. 5 Gonzaga beat Loyola Marymount 93-55 to remain the nation’s only undefeated Division I basketball team this season. Przemek Karnowski finished with 17 points and Zach Collins added 15 points and nine rebounds off the bench for the Bulldogs (16-0, 4-0 West Coast), who had six players scoring in double digits. Silas Melson scored 13 points as a reserve, Johnathan Williams grabbed 12 points and seven rebounds, while leading scorer Nigel Williams-Goss and Josh Perkins each had 11 points for the Zags, who were beating Loyola Marymount for the 15 straight time since 2010. Buay Tuach led the Lions (8-8, 1-4) with 19 points on 7-of-10 shooting, but none of his other teammates reached double-digit, while the team turned the ball over 22 times in the defeat. “The biggest issue was our inability to take care of the ball,” Loyola Marymount coach Mike Dunlap. “Those turnovers gave them easy baskets,” Dunlap said. 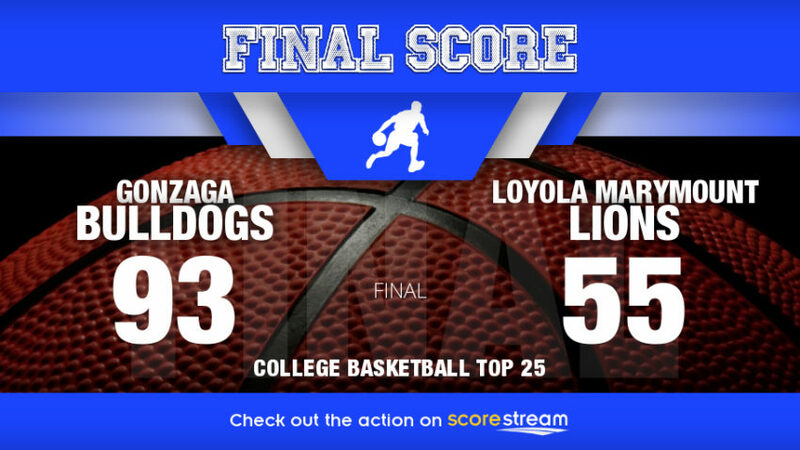 Gonzaga led 46-35 at halftime and then outscored Loyola Marymount by 27 points in the second half to cruise to the comfortable victory. The Bulldogs won the rebound battle 41-37 and scored 35 baskets on 21 assists on the night. Thursday night also saw two AP Top 25 teams falling, as No. 17 Purdue lost 83-78 to Iowa and No. 25 USC suffered an 86-64 defeat to Utah.